Can Japan Win Australia's Submarine Contract? Domestic factors will play just as much of a role as actual technology when it comes time to select the winning bid. Australia is looking for a long-range submarine, about 4,000-tonnes, bigger than the 3,300-tonne Collins that it currently fields. To compete against Japan’s 4,200-tonne Soryu class, TKMS is submitting a 4,000-tonne Type 216, and DCNS is offering a smaller, non-nuclear variant of its 5,300 tonne Barracuda-class submarines. As part of the ten-month process, Australia is asking each of the competitors to submit three different plans – a plan for building all the submarines in Australia, a plan for building all the submarines abroad, and a hybrid plan that will allow for a mix of production sites. Due to the secrecy surrounding Japanese interactions with the prime minister’s office, Tony Abbott has been accused of concluding a “secret deal” with Japan. Such charges are overblown, but Abbott’s preference for working with Japan – in part because of U.S. enthusiasm for a Australia-Japan venture – is well documented. However, more recent signs indicate that Japan is willing to do what it takes to accommodate Abbott’s balancing act. 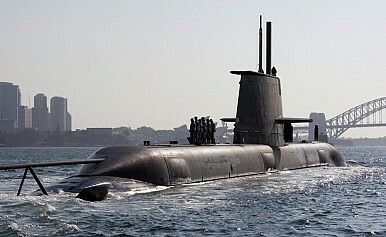 Japan is now considering working with Saab, a Swedish shipbuilding company, to build some of the submarines in Australia. Saab already does submarine work with Japan and in Australia, and could help ease Japan’s transition into becoming a major weapons exporter. For example, Saab already has 350 specialist staff in Australia. Another option for Japan is to work with British companies, as sources in Tokyo have told Reuters. Babcock International Group and BAE Systems have reportedly approached Mitsubishi and Kawasaki offering help, and other British defense contractors may be involved as well. Again, the main advantage to Japan of working with British contractors would be to smooth its entry into the global weapons market writ large, as well as Australian shipyards on the ground. Specifically, Babcock does maintenance work on Australia’s Collins class, and BAE Systems employs 4,500 people in Australia. Xenophon is the darling of those opposed to a foreign build. He has already threatened to run candidates against Abbott’s Liberal party in South Australia. Liberals know that the decision of where to build these submarines – a decision about Australian jobs and tax dollars – will play a large role in the next federal election, which is not too far in the future, as Australia must hold its next lower house election by January 2017. Faced by the stark realities of Australia’s politics, Japan is tentatively beginning to explore ways to compensate for its lack of experience. TKMS is also upping the ante by promising to transfer manufacturing know-how to local companies and take a stake in the Australian Shipbuilding Corporation if awarded the contract. TKMS has ambitions to transform Australia into a shipbuilding and maintenance hub of the Asia-Pacific. While European partners are demonstrably more eager to build in Australia – and hence, better for Abbott’s political fortunes – as extra-regional actors, a submarine deal with either France or Germany will not create the same sort of regional grouping that a Japan-Australia deal could. Ultimately, Abbott is seeking a deal with Japan, despite the high political risks, because he sees the deal with Japan as a way to put a down payment on supporting the U.S.’s “rebalance” to the Asia-Pacific through burden-sharing. A successful Japanese bid not only increases Australia’s own defense capabilities through a submarine upgrade, but also helps boost Japan’s defense industry by allowing Japan to export a major weapons platform for the first time since the end of WWII. How Will Australia Choose Its Next Submarine Builder? As France, Germany, and Japan promote their bids, a look at Australia's wishlist for its next submarine class.